← Dance in the Vampire Bund episode 4: Who needs fangs and supernatural powers if you have money? For Day 1, in the light of the new Gurren Lagann movie, I’m going to talk about my second favorite pairing in Gurren Lagann, Kittah/Yoko. I know, I know, why Kittan and not Kamina? 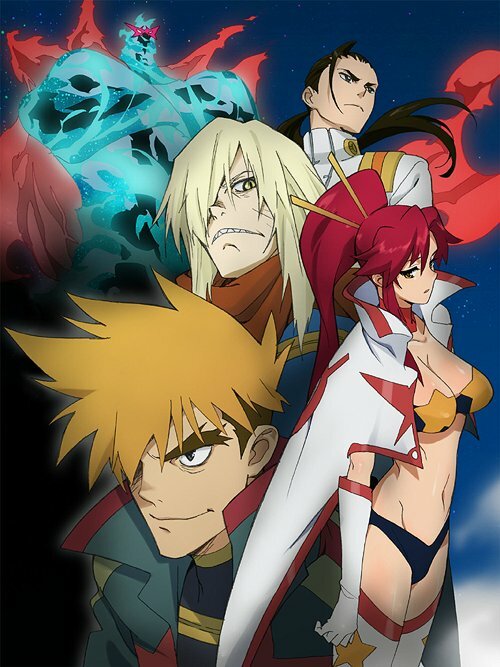 A lot of it may be that while I see the parallels between Kamina and Kittan, with their similar personality and GAR tendencies, I find not only Kittan a better developed character, but I found the relationship between Yoko and Kittan also had better development. Yoko and Kamina was the stereotypical tsundere girl relationship, and fairly predictable. Kittan and Yoko was not expected, but also slowly built up with conversations between them. Due to the way the relationship was developed between Kittan and Yoko, the chemistry that was growing between the characters was strong, and felt real. Unfortunately, this made his death more tragic…Kittan was the second of Yoko’s doomed loves. 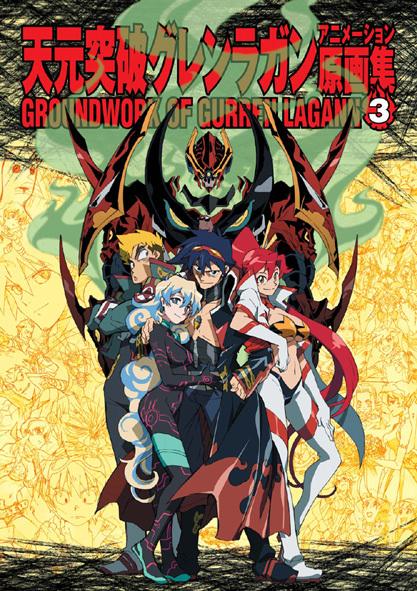 After confessing his love for her, he dies, and joins the large Gurren Lagann graveyard. That is my defense to why I support Kittan and Yoko rather then Kamina and Yoko. A realistic non-cliché relationship. In the end though, maybe I just like the underdog. Especially one that never really got the girl. Edit: If you’re a commenter here to inform me that this is ridiculous because Yoko can only have feelings for Kamina, get out. At this point, Kamina has been dead for seven years, the girl is allowed to move on and have feelings for other people. I’m really NOT interested in hearing why my ship is wrong and yours is right. I’m a Kittan/Yoko fan, too. While I would have loved to see their relationship developed more before and up to Kittan’s death, I am pretty pleased with what the show gives us. The way I interpret it, Kittan has from the beginning considered Kamina his rival. But Kittan’s not stupid: he appreciates that Kamina is worthy of his admiration as well. So Kittan, while competing with Kamina in many ways, still looks up to Kamina, especially after the latter dies. Kittan probably was always attracted to Yoko (I think all the guys in the show are, judging by the way they all–including Simon–oggle her when she first appears in her new space outfit), but because Kittan puts Kamina up on a pedestal as everyone else does (including viewers, and I’m definitely on that bandwagon), I think he probably doesn’t consider Yoko a possibility. She was in love with his dead rival/leader, and he understands her loss in some ways. I think the entire Dai Gurren Brigade understood her loss because it was similar to (though greater than) their own. After the defeat of Lord Genome, Yoko sticks around for a while, but she is gone for at least a year before the events following the time skip. Kittan and everyone else is so busy building up Kamina City and discovering their new lives, it’s hard to say how much interaction Kittan and Yoko had then. But the Kamina City life didn’t suit either Kittan or Yoko, we can see that much. I think they could understand each other that way. And when the Anti-Spiral threat brings them together again, I think their Brigade camaraderie is comfortable and welcome to them. Yoko is partially (but not completely, as we see in her desired AU later) past that life of excitement and danger, and Kittan isn’t past it at all. After 7 years of government work, he’s ready for action, and we definitely see that in his last episodes. I think that sense of getting the life he knew and wanted back helped him to feel empowered. And to see Yoko was doing well probably helped him see that her grief for Kamina’s death, while forever painful, was not something that crippled her. I think he could see that she was getting past it, or at least dealing with it in a way that would not exclude the possibility of them becoming closer. Kamina will always be a man Kittan admires. And concerning Yoko, Kamina will always be his rival. But now he’s ready to give it a shot. I think the timing and events are very important for this–not just because it maximizes the drama and TTGL is a show and story that maximizes everything but because this makes sense for Kittan’s character and personhood. Kittan’s feelings for Yoko are more rushed than developed in the show, and it’s really hard to say how or if she reciprocates, but I think perhaps she does. She might not have thought of him in that way until he kissed her, but the way he kissed her is very reminiscent of how she kissed Kamina: she snuck up on him just as Kittan snuck up on her. Kittan acknowledges that he took her by surprise and doesn’t seem to expect her to feel the same about him. I think this goes back to the possibility that he sees, that he could have had a chance with her in the future. He apologizes for kissing her all of a sudden like that. He knows it was not the ideal thing to do. But he also knows he’s about to sacrifice himself for the team, humanity, Earth, everything, and the chance to kiss the woman he now realizes he loves more than any other (or so we can assume since the show doesn’t suggest he has any other romantic possibilities) is not a chance he’s going to pass up. And I think Yoko sympathizes with that: even though she doesn’t kiss him back as Kamina kissed her back, she does hug him and seems genuinely to care about him as a dear friend. I would argue that she herself acknowledges, too, that she could care for him as something more. In her desired AU, she literally can see herself marrying Kittan and presumably having a happy life with him. She is watching a hand change the channel, flashing through scenes of a life she could have had. But Yoko herself turns off that TV just before she and Kittan kiss. The perspective of the shot moves back, and we see that Kamina is holding the television, and the two of them are standing in the space where and the time in which they first kissed. 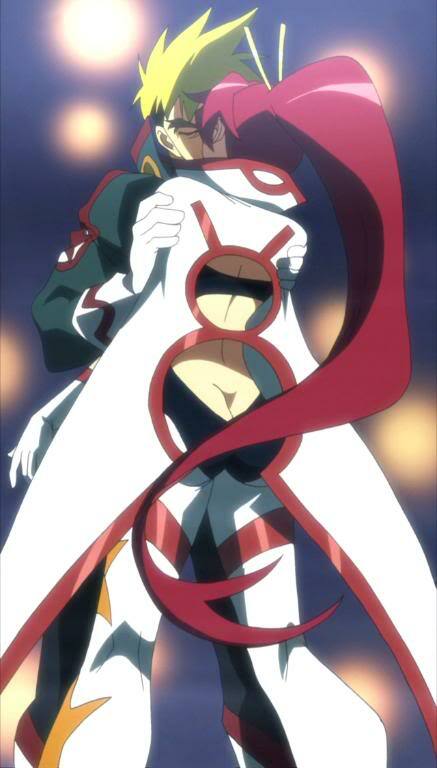 I think this scene acknowledges that Yoko has room in her heart for both Kamina and Kittan, and while it suggests that she ultimately loves Kamina more and will never let go of her love for him (if the TV expresses her heart’s desires, then Kamina holding it is more or less holding her heart–also, the cobbled-together wishes the TV shows are finite and superficial, while for her, Kamina is the limitless and real), this scene also shows us that Yoko can see her self being happy with Kittan, too, if things with Kamina couldn’t work out. Sadly for her and all of her fans, things didn’t work out with either Kamina or Kittan, but what I like best about her character is that she is full of love and able to share it with so many people. Kittan included and even in a romantic way. I also would like to mention that I love how Kittan’s story ended. (I don’t love THAT it ended, but I love how it ended.) In his final moments, he discovers the Spiral power and successfully uses it in his own Mega Drill type attack. I think this is right in keeping with Kittan realizing his own potential (he acknowledges that the Spiral power is humans’ power and is his soul), and he finally shows himself and the viewer and everyone else that he is not simply a lesser man standing in Kamina’s shadow: he is a man with purpose and power enough to cast his own shadow and to have his own place. His death is tragic because he has finally come into himself. Even sadder, he might not have achieved as much if he weren’t facing that situation and everyone was depending on him and he knew it was his last fight. But he does achieve all of these things, and I think he can be considered Kamina’s equal for it. I think Yoko considers him as much, and though she will always keep Kamina in a very special place in her heart, she has certain things in common with Kittan that make him more than a Kamina substitute. Kittan knows her grief as much as she knows his, and he is willing to join her in whatever future they can have together (I think that’s the significance of him mistakenly thinking she has given birth to a slew of kids). Yoko teaches (and to an extent raises) the children of the future, and Kittan does all that he can for that future. What drives them and what they hope to achieve is far more specific and grounded than Kamina’s dreams ever were. Which is what makes Kamina so amazing and awe-inspiring, but that’s not to say Yoko and Kittan couldn’t find happiness together if Kittan hadn’t died. It’s okay that it’s long, I think you did a great job describing how you viewed the characters and their relationship, and backing it up in a way that’s hard to argue. I agree that she’ll always love Kamina, but I think she’d also want to move forward in her life rather then remain in the past.